A valentine’s card is standard practice for most couples on valentine’s day. But if you want to make yours that bit special and a good impression then including a loving or heartfelt poem will work wonders. Poetry had since the dawn of time been used to express feelings. Romantic and romance have featured in poems for years and make up some of the most famous. So being able to use one in a card to your significant other is the perfect solution.to any valentine’s card worries you are having. 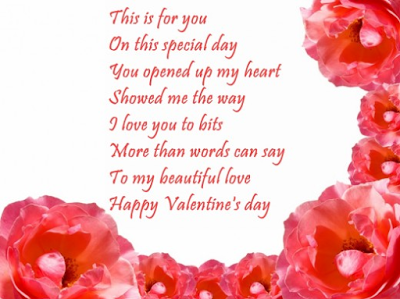 So try one of the many valentine’s poems below and just wait for the positive reaction for your loved one. You set my world on fire. My love to you won’t ever end. Sit down over there,take a seat. What happens now you have no say. You get naked and guess the rest.